A couple rebuilds a 1940s house into an easy-to-live-in urban farmhouse. An extensive backyard garden is part of Leslie (left) and Jessica Bower’s new house which was built on the foundation of the original 1949 structure. With spectacular views, bright southwesterly light and a location right in the heart of the city, Jessica and Leslie Bower’s Central District property was perfect in all ways—except for the house itself. The 1949 home “was literally falling apart,” says Jessica. “The exterior siding and the bathroom floor was rotting, the windows were single pane and drafty, there was mold in the kitchen.” They either had to pour money into fixing the house or tear it down and start over. In the end, they chose the latter. One of the biggest cost-saving decisions was made early on: to retain the foundation and first-floor framing of the original house; the rectangular footprint was easy to work with, says Schaer. Keeping this also classified the house as a remodel instead of a new build (sparing the couple from the city requirement to add off-street parking). The new, modern design, which incorporates farmhouse elements, totals 2,206 square feet and includes a second floor, which features a master bedroom and bath suite, plus two guest rooms and a combined guest bathroom/laundry room. 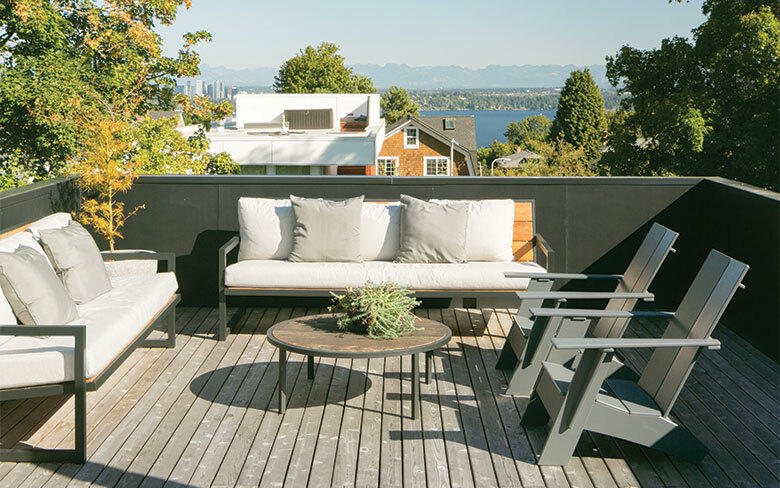 The house also has a roof deck to take advantage of Lake Washington, downtown and mountain views. Large glass sliders brighten the upstairs bedroom and lead to a small deck overlooking the garden. 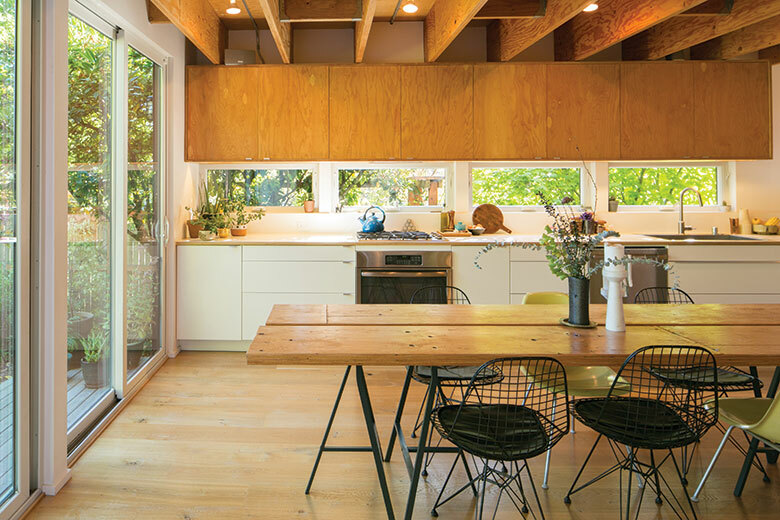 A striking feature of the home, which reflects the couple’s informal vibe, wasn’t part of the original plan: the open-frame ceiling, made with LVL (laminated veneer lumber, a rough engineered wood). “Originally, we were planning on painting that a light gray,” says Schaer, but once the beams were installed, the architects and the couple agreed they preferred them bare, and Leslie sanded the wood herself. The exposed ceiling beams span the entire length of the house, cantilevering past its walls to support the new front and back porch, so in profile, the house’s structure gives the impression of “spreading its wings,” says Schaer. Another farm-style design element was the addition of space for a 10-foot-long dining table in the kitchen, rather than creating a separate dining room. Sliding glass doors open from the kitchen out to the back porch, which serves as a functional pathway between the house and the Bowers’ extensive backyard and vegetable garden. The porch also features a handy bike and tool storage closet. Located in the Central District, the Bower’s lush yard and garden are an urban oasis. 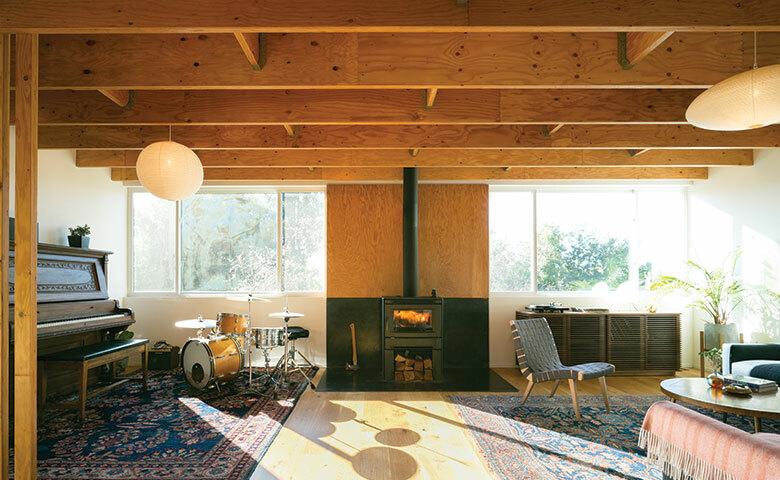 Eschewing a dedicated space for a dining room meant more space in the living room, where the Bowers can scatter their musical instruments; they also added an energy-efficient woodstove, which sits in the middle of the living room and centers the whole lower floor. There were small budget compromises along the way—fiberglass rather than pricey wood windows, Ikea cabinets, bare-bones lighting components, and a vegetable washing station that got pushed to the wish list for another time. One element, the roof deck, was nonnegotiable, even after the Bowers learned that it would cost a little more than they had hoped. It’s one of their favorite features. 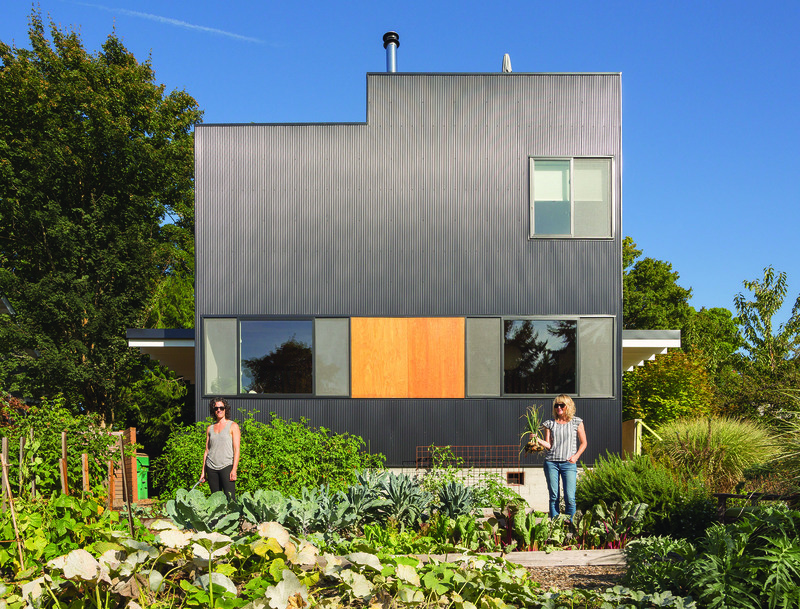 This Central District remodel was selected by a panel of architects for the AIA Seattle (aiaseattle.org) Home of Distinction program as a great example of creating spaces that meet the needs of the homeowner’s program desires, while staying within aggressive budget constraints.